Today on Quora, someone asked, "What are some software and skills that every Data Scientist should know?". I wrote the following as a response, reflecting on my current position and the role I play. 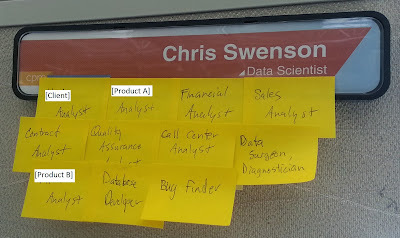 I started adding post-it notes with sub-titles to my name/title tag on my cube, as sort of a joke regarding the question, "What is a Data Scientist?". So it would appear from this list that there isn't a lot of data science going on. And that's partially true. Each of our clients has its own relational database, so we do "meta-queries" to access them one by one in order to answer a question. That's sort of data science like. Eventually, though, we're going to have one master database with all clients that will cascade into individual databases. So our "meta-queries" will be obsolete. We deal with a lot of "big data" too, but it's usually not that big of a deal. Even with relational databases, it's okay. Some queries may take a little longer (30-60 minutes), but that's rare. We have some machine learning tasks that pull in massive training data sets, so at that point you have to be more careful about "big data" problems like running out of RAM or disk space. But it can be handled, and rather simply. What I really wish I could do more of is machine learning, and while I've accumulated several ideas that would enhance products or help us make better decisions in the year I've been a Data Scientist, these other tasks take up most of my day. In the end, I write a lot of SQL, use the Linux command line moderately, and report on data in Excel spreadsheets. I use Python occasionally to write scripts. And I'm always learning something new (new SQL techniques, Python libraries, Linux command line tools, etc.). Each dot in the above chart represents a person, and each line represents a connection between people. The larger the dot, the closer the relationship. I am at the center, and unique clusters of people become apparent by their interrelationships, and they are grouped together in space. The lab does not label the clusters, but it does identify the clusters by color, and it allows the user to identify those clusters and name them, as I have done above. Further, you can explore your network by hovering over the individual dots that represent people. 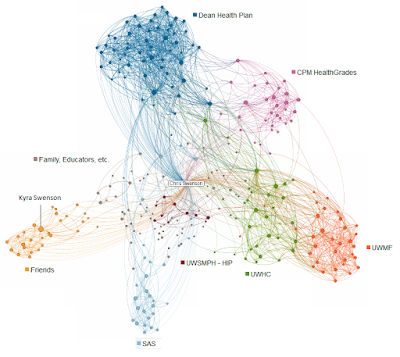 Essentially, five groups arise from my network: Family, Friends, and Educators on the left; Dean Health Plan at the top; CPM Healthgrades at the upper right; the UW Health System, which is composed of the University of Wisconsin Medical Foundation (UWMF), the University of Wisconsin Hospitals and Clinics (UWHC), and the University of Wisconsin School of Medicine and Public Health (UWSMPH); and finally the SAS Institute at the bottom. The lab isn't perfectly accurate, but it is pretty good. I checked out a number of individuals and some don't make sense, but most do. As an example, my wife is one of the larger dots on the left, which makes sense, since she also has networked with our friends and family on LinkedIn (although I usually avoid doing so for a number of reasons). The UW Health cluster is visually split, but there is apparent movement and interrelationship between the organizations. There are some people who traveled between the UW and Dean, one way or another. The same is true between Dean and CPM, with most, I believe coming from Dean to CPM. There are some hubs in each organization, likely managers, project managers, or other people who attended a lot of meetings (I think one of the big dots at Dean was an IT manager who sat in on a lot of projects). Of course, charts like these leave out people who aren't on such sites as LinkedIn, but I would think that all the other people would compensate for them when graphed like this. Additionally, I don't have much of a network for old jobs like the ones I had in college, nor have I really networked much with fellow college classmates. It would be interesting to see what other people's networks look like, especially people who are essentially professional networkers, like HR professionals or recruiters. How do networks in different industries look (mine is mostly health care)? What if you have someone who only networks with family or friends? What does that show? Perhaps different geographic locations you've lived in? How about someone who is a world traveler? This type of graph is very powerful in that makes you think about the data behind it and ask such questions as I have done. It opens up doors we haven't thought of and inspires curiosity.